The Untold Story Of Argo City! / Supergirl's Rival Parents! / The Black Canary / Villainy, Incorporated! / Trap Of The Crimson Flame! / In The Hands Of The Mericless! / Mystery Of The Black Cat! / The Duel Of The Gimmicks! / The Black Magic Of Supergirl! "The Untold Story of Argo City": When Supergirl has dreams that her parents, Zor-El and Allura, are alive, she receives confirmation from the telepathic Comet that they are extant somewhere "in the Zone" and trying to communicate with her. Supergirl goes to the Phantom Zone for a time and tries to learn the truth from the mad priest Jer-Em, who is repentant and tries to tell her. But the other Zoners block his transmissions with mental interference. Finally, at the Fortress of Solitude, Supergirl uses Superman's chronoscope to learn the truth about Argo City. Zor-El had discovered another "zone" on a different wavelength from the Phantom Zone. Calling it the Survival Zone, he attempted to send himself and Allura there with a ray treatment, but apparently failed. However, after they send Kara to Earth in a rocket and the people of Argo City are dying from Kryptonite exposure, Zor-El and Allura fade into the Survival Zone by a delayed reaction of the ray. Overjoyed, Supergirl pledges to free her parents from the Survival Zone. "Supergirl's Rival Parents": Supergirl finally makes contact with her parents in the Survival Zone through an "ultra-sensitive radar screen", and Zor-El mentally instructs her in constructing an "ionic ray" to free them from the Zone. The device almost malfunctions when she uses it due to a power brownout in Midvale, but Fred Danvers, an electrical engineer, sets things to rights and Zor-El and Allura emerge from the Survival Zone into Earth. Supergirl has a joyous reunion with her real parents and introduces them to her foster parents. However, the tearful dilemma of which parents Supergirl will live with is posed. Ultimately, Zor-El and Allura decide to leave Supergirl in the Danvers' care, and, with the help of a shrink-ray, go to live among their own people in Kandor. "The Black Canary": This story is reprinted from Flash Comics #86. 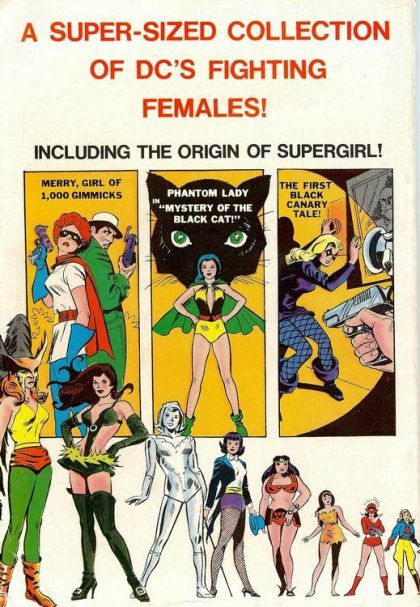 "Villainy, Incorporated": This story is reprinted from Wonder Woman #28. "Mystery of the Black Cat": This story is reprinted from Police Comics #17. "The Duel of the Gimmicks": This story is reprinted from Star-Spangled Comics #90. "The Black Magic of Supergirl": While patrolling in India, Supergirl sees a fakir die when he is struck by a cobra. With his dying breath, Abdul, the fakir, bequeaths to Supergirl a small casket containing the Satan Ring, and a scroll. The last part of the scroll is torn off, revealing that the ring will grant wishes, but the third wish will turn the wisher into a demon--with horns such as she finds on Abdul. Supergirl, in the days to come, uses the Satan Ring's magical powers to save Superman from Kryptonite (a pair of skeletal hands hurl it into the sea), to save an innocent man from the electric chair (a skeletal hand pulls down the knife switch while a ghostly figure sits in the chair, short-circuiting it), and, though she fears the third wish, to save her father's life during an operation (the skeletal hands guide the surgeon). 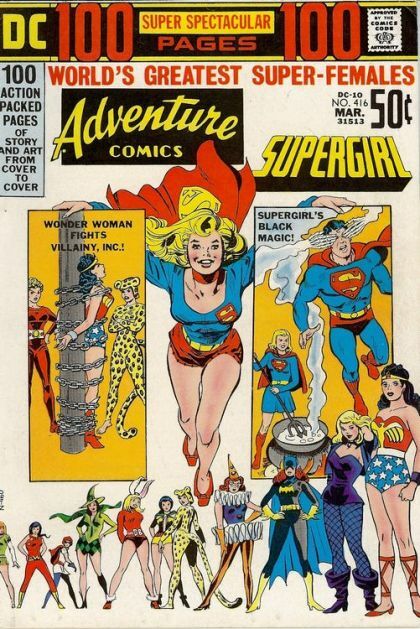 As a result, Supergirl gains horns on her head, and, despite her resistance, does evil. At one point, she makes a witch's brew that produces ghostly hands to blind Superman. However, she visits India again, and sees that Abdul is alive, after having been cleansed by fire intended to cremate him. Supergirl recovers the last of the scroll, which says the curse can be lifted by fire. Not even the heat of the sun works on her, but Supergirl comes across the Fire Falls of Krypton, hurled intact into space. She bathes herself in its Kryptonite-tinged flames, and is cured.